An elite apartment, type ‘RESIDENCE C’, is now released for a special sale. The apartment with a total area of 417.6 m2 is located on the 22nd floor in the ‘North Tower’ of the 5+ star residential complex (condominium) ‘St. Regis Bal Harbour Resort‘, which is built on Collins Avenue, in a fashionable area Bal Harbour of the Atlantic coast on Miami Beach, USA. 2 panoramic balconies for relaxation. The total area of the apartment, including both balconies, is 99.5 m2 and is measured between the outer wall surfaces and wall structures, without taking into account the actual thickness of the walls, finishing layers and coatings. The interior of the apartment is designed by the famous American architect Steven G. His style is renowned for its refined laconism and purity of geometrical shapes. An elegant décor in a neutral palette of colours with luxurious furniture and modern art objects seamlessly complement the natural beauty of the ocean and Miami landscapes. The residential complex, bearing the name of the world-famous brand ‘St. Regis’, is built on Miami Beach, one of the most prestigious and respected resorts on the East coast of the United States. It deservedly represents the peak of exquisite style and a quality of life, embodied on the Atlantic coast, in an ultra-luxurious residential and social environment, with the widest range of luxury supportive services utilizing modern smart technologies. The panoramic bird’s-eye view of the residential complex ‘St. 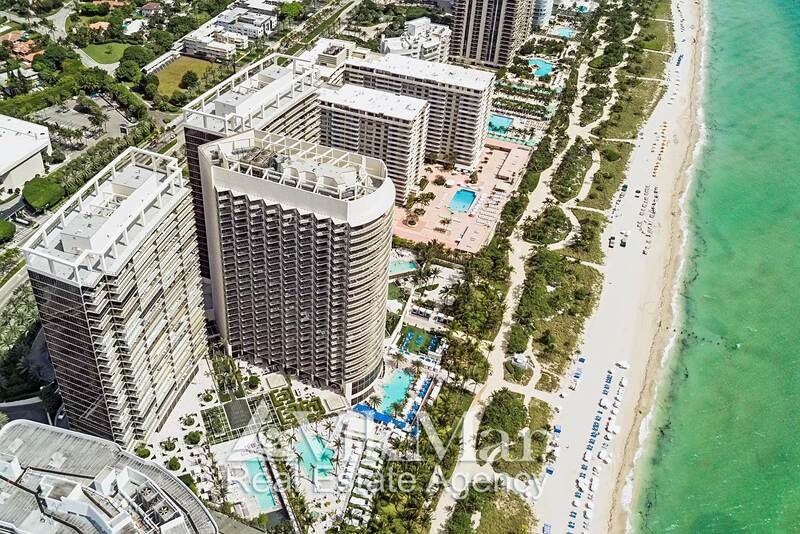 Regis Bal Harbour Resort’ and of the beach area of the Atlantic coast on Miami Beach, USA. The elite apartment is located on the 22nd floor of the second section in the ‘North Tower‘ building of the complex ‘St. Regis’. From the 4th floor onwards, each floor contains 3 luxury apartments, of types ‘RESIDENCE C’, ‘RESIDENCE E’ and ‘RESIDENCE D’, together with central area’s incorporating internal corridors, halls with three elevators, two evacuation staircases and technical rooms. Access to the 22nd floor of the second section is made from the main lobby of the residential building via elevators which serve owners and the guests of those types’ apartments. Two evacuation staircases are also provided for access to the lower floors of the “North Tower” and for emergency exit from the building in case of fire, natural disasters and other emergencies. The apartment ‘RESIDENCE C’ is equipped with two entrances adjacent to each other. The first entrance from the elevator’s hall leads to the entrance-hall, and the second from the corridor, leads to the western lounge. Through the same hall, there is an exit to an evacuation staircase within the residential building of the ‘North Tower’. The apartment faces East and West and has external panoramic transformable glazing. There are exits to the open balconies of the terrace, which are equipped with a shockproof glass railing. 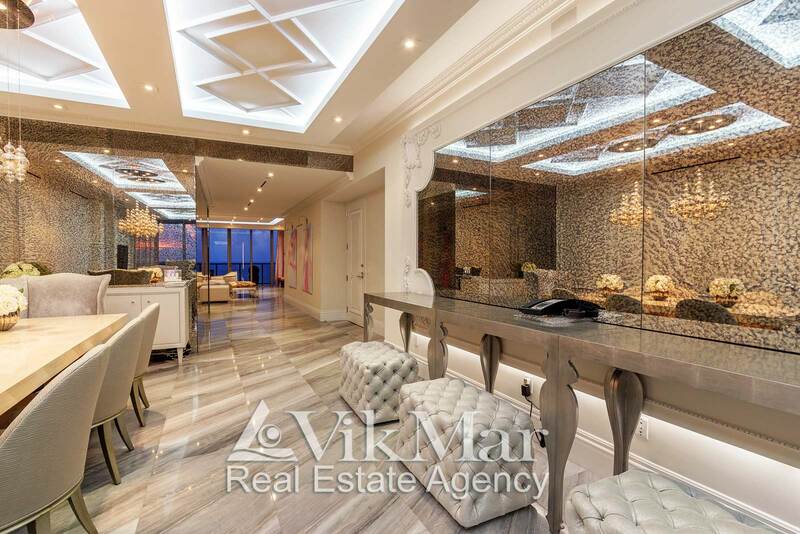 As a result, you can enjoy the spectacular panoramic views of the developments and beaches of Miami Beach, the Atlantic Ocean, Biscayne Bay and areas of Miami city directly from its lounges, bedrooms and the kitchen-dining room. 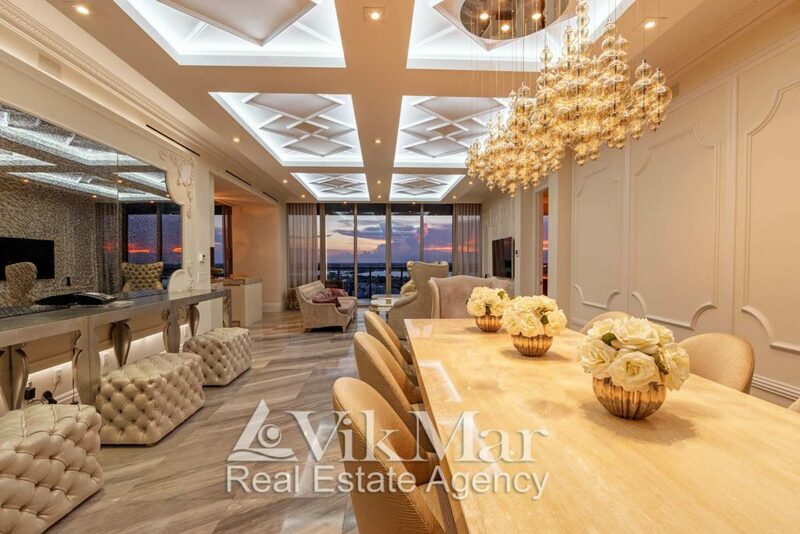 The interior of the elite ocean-view apartment in condominium ‘St. Regis Bal Harbour Resort’ on Miami Beach, USA. All planning, technical and aesthetic characteristics of the elite apartment in the residential complex «St. 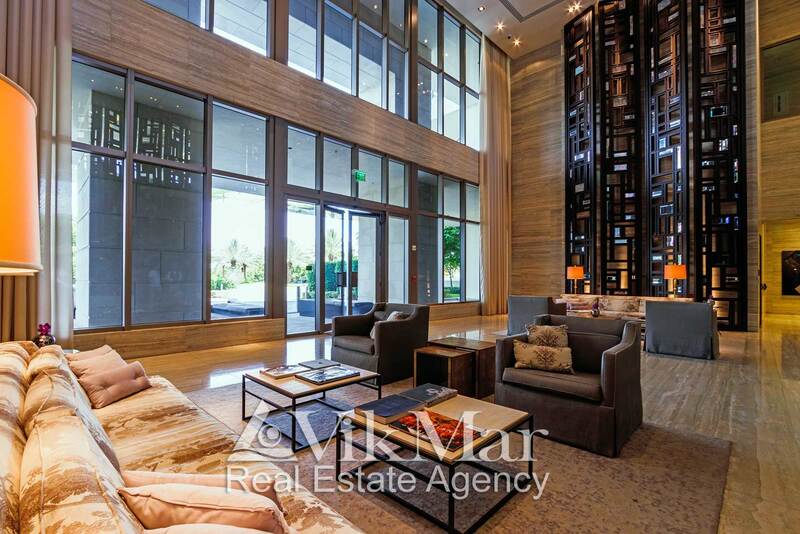 Regis Bal Harbour” provide the highest level of security, privacy and comfort on the Atlantic coast of the resort area of Bal Harbour on Miami Beach, USA.